I'm pretty sure I'm not alone on this one, but sometimes I need a creative kick in the pants for me to keep getting my pen to paper or for my little digits to continue pounding out words on my MacBook. I know some people are just naturally inspired and have a muse sitting on their shoulder (I'd find that a little spooky in all honesty), but honey, that just isn't me. So what's a gal to do when she needs that boost? I turn to those who do creativity (IMHO) best! I take a break and journey over to Planet SARK for all the fun, color, and community her site offers as well as to bask in her juicy works and encouragement of creative dreams. There is always a breath of luscious air when I visit so I do so often. 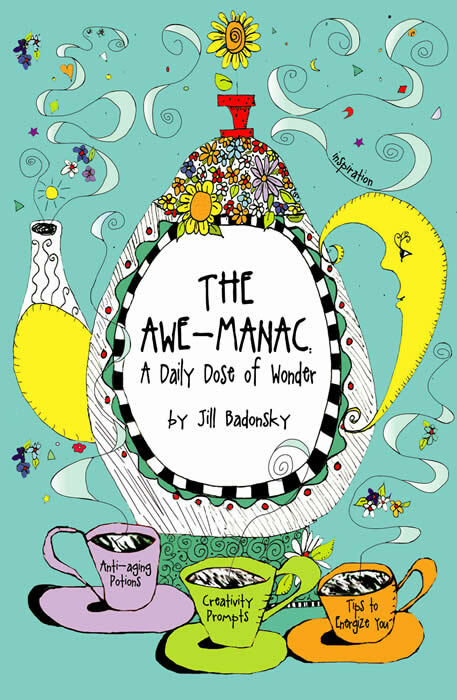 Over the holidays, I was able to get into a few bookstores and uncover a new little gem of inspiration called The Awe-manac: A Daily Dose of Wonder by Jill Bandosky and I have to say, this truly IS a daily dose of wonder! Each day there are new exciting ideas to ponder such as themes for the day, trivia (did you know that just the other day we celebrated Get Out of Your Boxer Shorts Day? ), what Jill calls Soul Vitamins, and my personal favorite, the Journal Juju that gets my pen moving with refreshingly original ideas! I've already had so much fun with this find and know that when I need a pick me up all I have to do is flip to the page of the day. Lastly, this is my fool proof suggestion for getting inspired and losing yourself in a land of words and art; I'm referring to the one and only Artella. Here you will find hours of new creative motivation including enrolling in e-courses, savoring all the articles in the Artella Daily Muse (the only daily online creative newspaper), engaging with their lively online community, participating in art swaps, browsing member blogs and just soaking up the view from the deck of any of their "member ships." I have been visiting Artella for over a year now and still am uncovering new sources of fun and creativity to get my pen into action. So how about you? What gives you that little extra boost of inspiration? I love Jill B (and SARK, and Artella, etc.). Jill's other book, The Nine Modern Day Muses (and a Bodyguard), is great. I didn't know she had a new one out. Will have to check it out! We appreciate your support of SARK! Have you seen the launch of SARK's fabulous new affiliate program called SARK SHARE (SHARE stands for SARK's Happy Affiliate Revenue Earnings).